Still in the throes of my writing project, which I have titled Project: Americano. Why? Well, it sounds good, and I’ve been working on it each day at lunch. I order an Americano, and that breezes me through 3-4 pages during my lunch hour. Less if the lady with glitter in her hair gets to the counter before me and orders five drinks. My foot is almost able to bear weight again. I haven’t been to the gym in over a week, and if I don’t go soon, my new motorcycle will not be able to bear my extra weight, and will fall on me again. I’d gotten this poster at a comic convention years ago but never found the film. Would we call them 10 "incredible" weapons? Finally, I found it on Netflix! And I watched it. The cover is a tad … misleading. 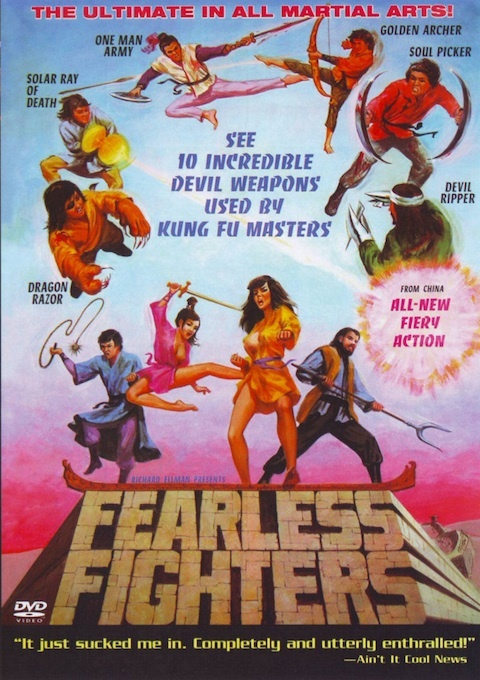 The special effects are lame, even for the period, as are most of the kung fu moves. However, for names like Lightning Whip, Solar Ray of Death and of course Dragon Razor (see how I worked in the Year of the Dragon? ), it’s pretty enjoyable for an hour and a half. So. Kung Fu, writing, and recuperating. That sums it up. I didn’t work the Dragon Razor into anything but the headline, though.